Selection, convenience, and price matter to millennial female holiday shoppers this season, and retailers that offer a mix of all three are aligned to have strong holiday sales. As part of the POPSUGAR Insights 2017 Holiday Report, we asked 3,000 US women to tell us their preferred retailers for holiday gift shopping and which retailer they would choose if forced to pick. Among the retailers we included, Amazon.com was the preferred choice of millennial women (31%) for where they plan to shop for gifts for friends or family. Target (28%) was a close second, followed by Kohl's (12%), JCPenney (8%), Macy's (8%), and Nordstrom (4%). Younger millennials were slightly more likely to shop at Amazon (34%) and 11% more likely to shop at Target (31%) than millennial women overall. Amazon.com (45%) ranks No. 1 overall in terms of helping millennial women discover the perfect holiday gift for friends or family, followed by Target (17%). Millennial women prefer to shop online (48%) over in-store (23%) for their holiday shopping, with 29% saying they have no preference. Younger millennial women are 93% more likely to say they prefer to shop in-store (34%) than older millennial women (18%). Younger millennial women are 48% more likely to say they prefer to shop in-store than millennial women overall. 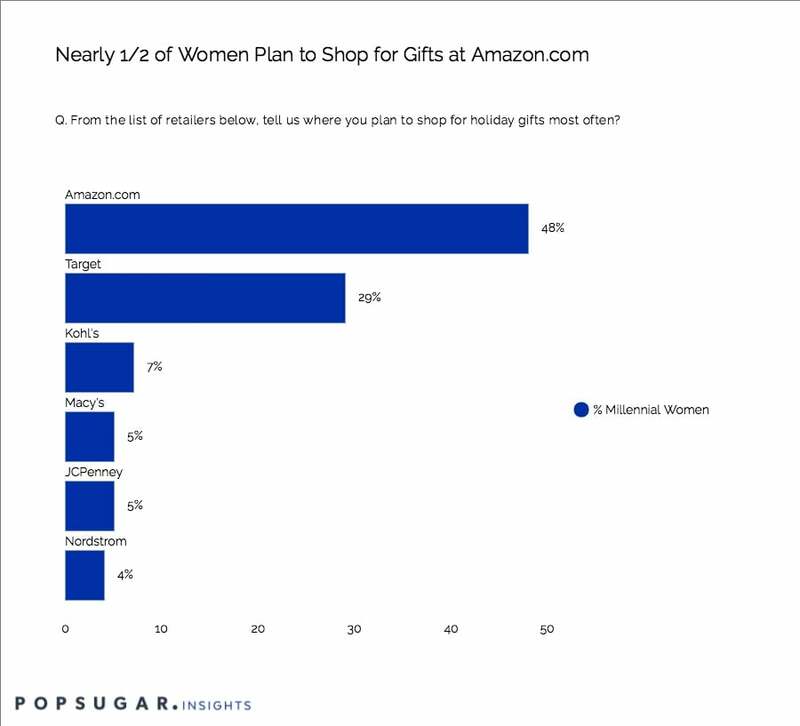 If forced to choose only one place to purchase all of their holiday gifts, most millennial women would choose Amazon.com. Reasons millennial women give for choosing Amazon.com include it's "the best place to discover the perfect gift," it "offers the best perks," and it "offers the best overall holiday shopping experience."